Can I still login with Google after Google+ is shutdown? If I created my Fitness Blender account through Facebook, how can I keep it if I want to delete my Facebook account? Where is the My Fitness Menu? Where are My Favorite Workouts? How do I add or remove a Favorite Workout? Where are my Purchased Programs? How do I add a program to the calendar? How do I view the Scheduled Instances of a program? How do I reschedule a program? How to I mark a program complete? Why are my purchased programs missing? Why does it say “Sorry, we could not add this program to your calendar.” when attempting to Add to Calendar? Looking for our Workout Complete clothing? Can I download videos to watch offline? How can I remove the ads from the videos? Why do the Videos say "Video Unavailable" when I try and view them? Can you recommend a program or workout for me? Mobile: On mobile and touch devices, the My Fitness menu can be opened by touching the user icon, which is on the right hand side of the menu bar next to the ☰ menu. Desktop: On desktop computers, the Sign In button can be found by mousing over My Fitness on the right hand side of the menu bar. Google, Facebook, and Blender accounts are separate by default. If you created a Blender login by filling out the form on the registration page and then the next time you logged in by clicking the Facebook or Google button on the Login page, then you created a second account. If you have accidentally done this, follow the instructions below to merge accounts. Google, Facebook, and Blender accounts are separate by default. If you accidentally created multiple accounts, you can merge them together by adding the social login of the other account. All of your purchases, favorites and workout history will be added to this account. And, you will still be able to login via either method. If you created a Blender login, start by logging into that account (if you have only a Facebook and Google logins, you can login to either account). Once logged on, go to My Fitness: Account: Login Information. On that page, under Social Logins click “Add” next to the Facebook or Google icon. On the login page there is a “Forget?” link in the password field. Click this to go to the Forgot Password page. Here, fill out your email address and click “Send Email”. You will then be sent an email entitled “Fitness Blender Password Reset”. In that email click the “Change Password” button. This will take you to a Change Password page where you can change your password. You will need to enter your username which is included in bold in the email. Once you have filled out your new password and saved it, you will be rerouted to the Account: Login Information page, where you can log in with your new password. Note: if you created the account with Facebook or Google, this will not work. Instead you must login through Facebook or Google. Yes, you will continue to be able to login with your Google/Gmail credentials even after Google+ is shutdown. 1) Logout, and create a new Blender account from the Join page. 2) After creating the new account, go to My Fitness: Account: Login Information. 3) Merge your existing Facebook account into this account by clicking the Add link next to the Facebook icon (instructions for merging accounts here). Once this is complete all your information from the Facebook account will be accessible from this account. 4) Optional: you can remove the Facebook login option by clicking the Remove link next to the Facebook icon. Mobile: On mobile and touch devices, the My Fitness menu can be opened by clicking on your Profile image (or first letter of your name if you don’t have an image), which is on the right hand side of the menu bar next to the ☰ menu. Desktop: On desktop computers, the My Fitness menu can be opened by mousing over My Fitness on the right hand side of the menu bar. From the My Fitness Menu, select Favorites. If you can’t find the My Fitness menu, click here. To add a favorite workout video, click the heart icon for that video on the My Favorites page, Video Listing page or on the Video Detail page. To remove a favorite, click on the heart icon from the My Favorites page, Video Listing, My Favorites or Video Detail page. This will make the heart be empty. Once the page is refreshed the video will be removed. From the My Fitness Menu, select Calendar. If you can’t find the My Fitness menu, click here. From the My Fitness Menu, select Purchased Programs. If you can’t find the My Fitness menu, click here. From the Purchased Programs page (can't find the Purchased Programs page? click here) click the “Add to Calendar” button for the Program you would like to add . On the pop-up calendar select the first day of the program. You will then see the scheduled program on your calendar in My Fitness. Click on a specifc day on the calendar to view the workouts for that day. How do I view all the Scheduled Instances of a Program? On the Purchased Programs page (can't find the Purchased Programs page? click here), there will be a plus sign on the right hand side of each program (if you have already scheduled it). Click on that plus sign and all of the scheduled instances will be shown. For each scheduled instance you will be able to Reschedule, Remove and Mark as Complete (if you are done with the program). From the Purchased Programs page (can't find the Purchased Programs page? click here), show the Scheduled Instances of the program (need help finding the Scheduled Instances? click here). Click the Reschedule button. Or, on the calendar day page, click the Reschedule button for that program. On the Program Reschedule page, select the first day that you want to move and the date you want to move it to. Click View Changes to display a calendar showing how the rescheduled program on the calendar. If this looks good, click Confirm Changes to save. If you don’t like how it looks, click Edit Schedule to modify the changes. From the Purchased Programs page (can't find the Purchased Programs page? click here), show the Scheduled Instances of the program (need help finding the Scheduled Instances? click here). Click the Remove button for the scheduled instance. Or, from the Program Reschedule page (need help finding the Program Reschedule page? click here) you can also click the "Start over" link to remove a scheduled instance of a program. How do I mark a program complete? You can only mark a program complete if you are on the last day of that program or later. From the Purchased Programs page (can't find the Purchased Programs page? click here), show the Scheduled Instances of the program (need help finding the Scheduled Instances? click here) . Click the “Mark Complete” button. The most common reason that purchased programs are missing is that you have accidentally created 2 accounts. Click here to find out if you accidently created a second account. Click here to find out how to merge the two accounts together. If this doesn’t solve your problem, please contact support. You will get this message if you try and schedule an instance of a program that overlaps with another instance of that same program. For example if you schedule FB Blend from January 1-13, and then try and schedule it again starting on Jan 10, it will give you an error message and display “You have already scheduled FB Blend in this timeframe.” Instead, try scheduling after Jan 13. Or reschedule the first instance to the dates you want (click here to learn more about rescheduling). Or, remove the scheduled instance (click here to learn how to remove a program) and then add it back. Our Workout Complete apparel line is sold at our sister site Workout Complete. Fitness Blender uses YouTube to show all videos. If you join YouTube Premium, one of the features is the ability to download videos to watch offline. It also offers Ad-free videos and a free Google Play Music subscription. Note: This is a service provided by YouTube and is not part of Fitness Blender. Fitness Blender uses YouTube to show all videos. If you join YouTube Premium, one of the features is ad-free videos. It also offers the ability to download videos to watch offline and a free Google Play Music subscription. If you are trying to view a Fitness Blender Video, and see a message "Video Unavailable This video is restricted. Try signing in with a Google Apps account", the WiFi network you are trying to view the video from has restricted access to YouTube videos at the "strict" level. Often times schools and businesses do this. To view the video, switch to another WiFi network or use a mobile connection. 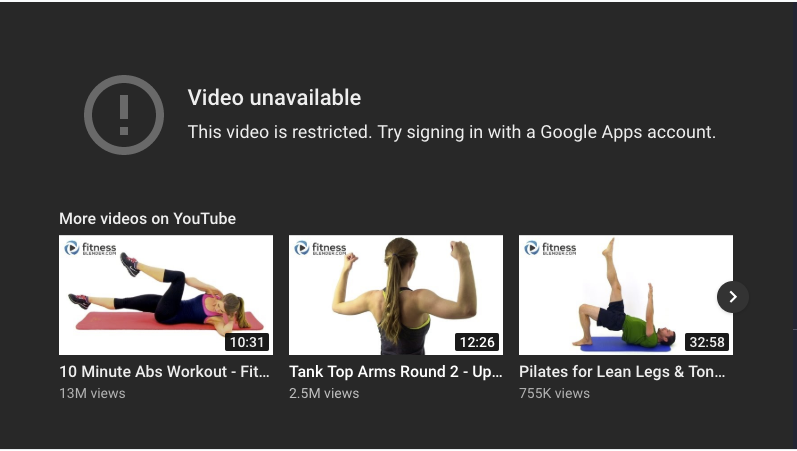 Technically, a "YouTube-Restrict:Strict" Header is being sent with the request to YouTube and many Fitness Blender videos are blocked at this level. There is a lower level "YouTube-Restrict:Moderate" Header which should be able to view Fitness Blender videos. Every once in a while YouTube accidently restricts Fitness Blender videos at the moderate level. Please contact support if you have been able to view videos on your WiFi network but all of a sudden the same videos are giving you this error. Fitness Blender does not currently have a mobile app. We did have one for a while, but unfortunately we decided to discontinue it. Instead, the website has a mobile friendly design. It is also possible to add the Fitness Blender website to your homescreen on iOS and Android. Unfortunately for legal reasons we are not allowed to give individual recommendations. You can start a discussion to ask the Fitness Blender Community for suggestions.